A European astronaut Paolo Nespoli captured this unique photo of the ISS from the departing Soyuz TMA-20 spacecraft on May 23, 2011. It was the only opportunity for a full view of the ISS with NASA's Space Shuttle and a European ATV cargo ship docked at the outpost. In 1869, the Atlantic Monthly published the work by Edward Everett Hale, where he described the "Brick Moon," a satellite 60 meters in diameter with the crew of 37, which helps to navigate ships at sea. At the turn of the 20th century, Konstantin Tsiolkovsky in Russia envisioned many elements of future spaceflight, including space station. By 1923, Hermann Oberth wrote "The Rocket to Planetary Space," a theoretical work, discussing among other things the roles and the design of the space station. By 1929, the H. Noordung advances the idea of the station further in his work "The Problems of Navigating the World." (92) With the beginning of Space Age, the space station concept could be examined based on existing technology. In January 1949, British Interplanetary Society, BIS, published detailed description of the Earth-orbiting space station designed by Harry Ross and Ralph Smith during 1948. The architecture of the 24-member orbital outpost featured a habitation module, a solar power-collecting mirror, communications antennas and the airlock. With the loss of the moon race in 1969, the Russian government adopted the space station concept as the major direction for the Soviet manned program. Since then several generations of the Salyut, Almaz and finally Mir space stations had flown. Mir-2 would follow as the main Russian effort in the manned spaceflight. The project went through several reincarnations during the 1980's and beginning of the 1990s, starting with the large space station launched by the Energia super heavy-lift booster and ending with a more modest design of the Proton-launched core and a single truss carrying solar arrays and helio-concentrators. Not unlike, Freedom project, the station could grow as more modules are added. However, unlike Freedom, the crew could board the station immediately after the launch of the first element -- the core module. In 1972, Nixon administration approved the development of the reusable Space Shuttle as a main direction for the US manned space program. The Space Shuttle was envisioned as a cheap and reliable transportation system between Earth and low orbit. For NASA it meant the Space Shuttle would launch and service a space station -- the next "logical step" in the human exploration of space. However these dreams were stalled for years by the difficult birth of the Space Shuttle. Finally in 1984, President Reagan gave official green light to the ambitious project, which envisioned permanently manned space station by 1991. As President Clinton moved into the Oval Office in 1993, NASA was asked for another redesign of the space station Freedom. In response, NASA came up with three options known as A, B, and C, however none of them would meet the projected budget restrictions. At the time, Russian Space Agency proposed NASA to merge Freedom and Mir-2 projects. The inclusion of the Mir-2 core module into the Freedom design would allow early presence of the crew onboard, while the use of Progress cargo ships would provide much cheaper and reliable refueling and supply capabilities for the station, comparing to the use of the Space Shuttle. On Sept. 2 Russian Prime Minister Victor Chernomyrdin and US Vice President Al Gore signed an agreement to merge Freedom and Mir-2 projects. The first launch within the ISS program took place in November 1998 and by 2010, a total of 100 missions had been launched by US, Russia, Europe and Japan from Florida, Kazakhstan, French Guiana and Japan to assemble and maintain the outpost. In 2015, the ISS was reported having a mass of 420 tons and providing habitation area with a total volume of 1,000 cubic meters. More than 100 spacewalks were completed in the first 15 years of its operation. NASA carried the biggest share of the station price tag. The US Space Shuttle served as a major carrier of the station's elements to orbit, including US-built main truss of the station, four sets of solar arrays, and radiators, US-built laboratory and habitable modules, interconnected with the special node modules, the big airlock for spacewalks, assembly and servicing platforms. US also planned a reusable "lifeboat" for the crew, which has never been built. The Western-European countries-members of the European Space Agency planned to provide the Columbus pressurized science lab and a free-flying platform, which could dock at the station. At the beginning of the 1990s, the length of the Columbus module had to be reduced, while the developed of a free-flying platform was cancelled. In a separate contract with NASA, Italy was building resupply modules carried in the Shuttle cargo bay. Last nut not least, a special Ariane-5-launched space tug, ATV, built by the European Space Agency with the Russian help, provided additional cargo supply capability for the station. 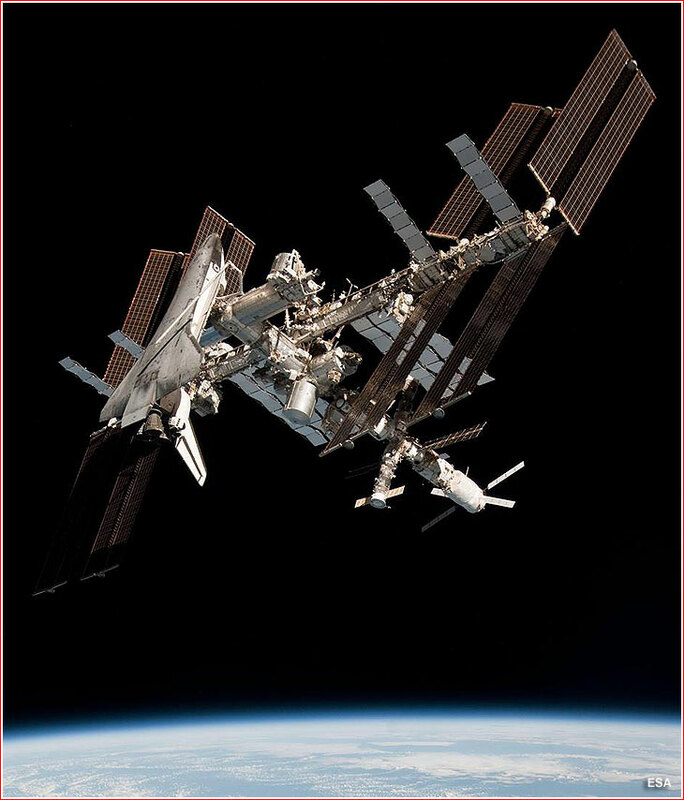 National Space Agency of Japan, NASDA, contributed a pressurized lab and unpressurized science platform for the ISS project. Although the original plans expected that Japanese launch vehicles and mini-shuttle could support the program, but neither was ready by the time the assembly of the station started in 1998. The Japanese expendable cargo ship, HTV, joined the program in 2009. Canadian engineers used their extensive experience gained in the course of developing of the robotic arm for the US Shuttle, to design even more elaborate and sophisticated robotic systems, which would facilitate the assembly and servicing of the International Space Station. Brazil promised to build special carriers, which would be installed externally on the station's main truss and serve as platforms for the outpost's payloads. On October 14, 1997, the Brazilian and US governments (represented by the Brazilian Space Agency - AEB and by NASA) signed an agreement where Brazil agreed to provide parts for the ISS to NASA and will have utilization rights. However, the program had never materialized.